I thought it was a good showing. Obviously, Red got off to a really good start in the first quarter. Then, White came on. I think the good thing about it is that everybody on both teams is playing for one team. I thought we got better as far as our preparation for the World Cup, and I look forward to continuing our domestic portion of it, where we will actually have an opponent that won’t be on our team. So, looking forward to playing Canada and Japan in the next week. We didn’t really run a whole lot of freelancing. Obviously, the players, they have a really good feel for the game. We did put in a couple of sets to give them a little bit of structure, but when you’ve only had two days of training camp, you’re going to see some of that stuff break down. But, it was encouraging to see when we were in a couple of our sets, we did get good looks out of it, whether we scored or not. We just have to make sure that we’re not getting empty (possessions). There were too many empty possessions throughout the game. International play will certainly make us pay for it. Yes, I’m pleased with the days that we spent here in Columbia. Every time that we made an adjustment, as far as on either side of the ball, the players really honed in and executed. As far as what we need, obviously, we need some outside shooting. It’s something that we’re probably going to have to deal with on the domestic tour on to our preparation for the World Cup and in the World Cup. We’ve got to add some outside shooting. Watching the WNBA Playoffs, USA Basketball won with whoever lost in the semifinals. We (will hopefully) gain Diana Taurasi, which should help, and then we’ll just hope that the WNBA Finals don’t go to five games, so we can add Sue Bird, because she played so perfect last night. Everybody’s not going. The college players are more than likely (returning to their campuses), with the exception of one or two. But everybody else will be going and playing. Everything is still fluid. We are waiting in the wings to get those players in, because they’ll add instant experience and they’ll just elevate the level of our preparation. The younger players are in the pool, and they’re in the pool for a reason because they can really play. Fortunately for them, the pool isn’t made up of what the pool was in the last Olympics and the Olympics prior to that, where you had 10-12 Olympians in the pool. That’s probably cut in half. It looks like there’s opportunities for them to take advantage of. The committee will decide whether they’ve done a good enough job to earn a spot on our team. Certainly, they’re making it very tough on the committee. The players at this level really know how to play. They know how to read what’s out on the floor. We just have to get more days together. We have to understand what we want from an offensive standpoint, and this is maybe a bit later than what they’re used to. Once we get used to it, we’ll understand where we can be efficient and effective. I’m looking forward to the times we can have on the court, whether that’s a practice or a shootaround. We have to utilize those times to prepare. It was fun to be back in Columbia, being back in my second home, being able to reunite with everyone, like old teammates and friends. Overall, just a great experience. I think I played pretty well. I was just loose out there, having fun with my game, and most important, doing everything I can to help my team win. Growing up, I had heard of Coach Staley, then she started recruiting me at a real young age. Then, I actually came to the basketball camps. But, I really started building my relationship with coach Staley when I transferred in here. I definitely miss playing for coach Staley. I always say we had fun. She’s a winner. Not too many people get the opportunity to play for an Olympian. She knows the game. She’s a teacher of the game, so when she tells me stuff to do, I do it, because she knows what she’s talking about. We always talk about memories we had. Being with each other again was fun, being on the same court, being able to practice with each other definitely brought back a lot of memories, and it was fun. No, it was all fun and games. We giggle and are silly on the court at all times. We joke back and forth overall, but it’s always fun and games for us. I’m just thankful for the opportunity, being able to compete with (USA) Red. Having A’ja (Wilson), Allisha (Gray), and Tiffany (Mitchell) out there made me more comfortable, and, of course, having coach Staley as coach. When she threw in plays, I already knew them, so I was comfortable and adjusted to the speed. I’m just happy to have this opportunity to grow and compete. My biggest takeaways probably (would) have to be communicating. What did you get out of this week? It was a great experience. I am so happy I could come, and it was fun to be able to play next to Nneka (Ogwumike) and Tina (Charles), who I watch on TV all the time. I definitely learned a lot from Tina, like keeping my arms up and staying strong on the post. So, I’m really happy I got to be here. How will this help you at Oregon? I learned a lot about being more physical, so hopefully I can bring that back to my team. I can help improve spacing on the floor and be a better leader for my team. It is always an honor. I love when Carol (Callan, USA Basketball Women’s National Team director) calls, and I’m like, ‘Okay, what are we going to do next. ?’ Hopefully I can keep doing it. In college, we're all kind of learning on the fly. We're all young, trying to get to the professional level. So, now that we're all there, a lot of things are expected from us. So, it's little different being a pro under her and a college athlete under her. Anytime I have the opportunity to lace up for USA (Basketball), it's a great opportunity for me to be seen by people, to have my name out there, to eventually become an Olympian, which is the ultimate goal. Anytime I get this opportunity, I definitely take advantage of it. I think so. I think I kind of slowed down a little bit. I'm trying to think the game more than try to play physical and just go fast up and down all the time. You kind of learn over the years your strengths and what you want to improve on. The time I had my first year, I was a rookie in the WNBA and oversees. Going into my second and third year, definitely just figure out things in my game, which I kind of gravitate towards. To this day, I still get goosebumps every time before a game, and it's even more now that I was here. I know I had so many people cheering me on and wanting me to do well. My first shot was an air ball, but then I got it together. It was just so refreshing to be in front of everyone. I kind of got too excited. I'm just glad I had the opportunity to play here one more time. Definitely just her competitiveness. I think I kind of take that from her, which is the reason I wanted to come to South Carolina to play for her. I saw a little bit of myself in her. She definitely rubbed off on me as far as always wanting to compete no matter the circumstances. There's a lot of people that are going to be better shooters than you, taller than you, faster than you, stronger than you. So, at the end of the day, it's definitely what's in here – your heart. She always taught me to compete no matter what. I think the game went pretty well. We were able to execute a few of our different things, and we saw some good things from a lot of different players, especially some of the college kids. Red started well, but White kind of took over as the game went on. For the most part, we had good things. We have to work on some things and keep working on what we’ve learned at this camp. 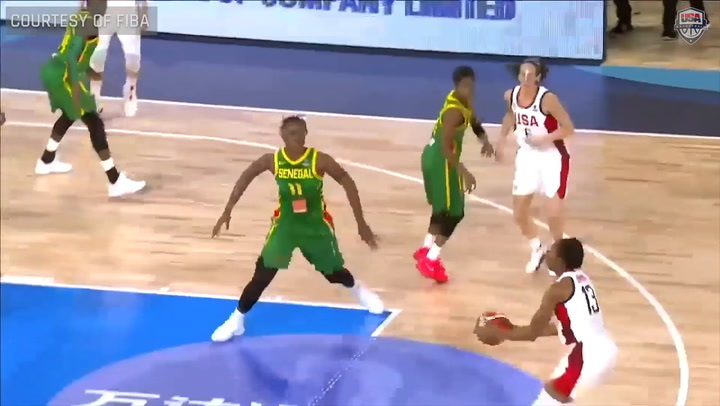 What worked for you tonight in scoring 17 points for USA Red? I was talking to my teammates and telling them to just be themselves, don’t be too nervous. I guess that’s the attitude I went with, too, when I went out there. I wanted to make sure we ran the offense well to get a lot of touches for a lot of people, and then I wanted to shoot whenever I was open, as long as they were good shots. So, that was my game. Who also impressed you from the USA Red team? I thought Morgan (Tuck) played really well. She was really good. And, I would say Diamond (DeShields). She is a really great facilitator, because she sees the floor really well. She gave us some energy points. How can you build on this for the next exhibition versus Canada? That’s the challenge. We are playing against our own teammates. So, the practices going forward now might be a little more comprehensive. We might build a little more chemistry since we get to play with each other and against other countries. I know Dawn (Staley) is really going to get more detailed into what we need to improve. What did the White team do so well to get the win? We started off a little slow. When we got to a timeout, we talked about picking up the defense. Then we got steals and rebounds, and we just went and then we really shared the ball well. What was your mentality tonight as the leading scorer? I was just trying to be aggressive on defense. That’s what creates offense. I was finding my teammates, and then they were also finding me for open shots. Who was instrumental in helping you score 18 points? I think the other guards – Kelsey (Mitchell) and Layshia (Clarendon) – telling me where to go, and then the posts were looking for me as they were getting doubled and kicking it out. What did this debut with the senior national team mean to you? It was a blessing to put on the red. I’ve been wearing navy and white (with USA Basketball junior national teams) this whole time, so to put on some red with the actual national team, that’s a blessing. I am honored to represent my school and myself in this way. What have the last three days been like, especially culminating with this game? It’s just an unbelievable experience. Anytime you get to represent the United States in anything it is a big deal. But, just to have those three letters across your chest and be out there with the national team players, it’s something special. It is something you can take a lot from and grow a lot as a player. What will you take back to Notre Dame to help you this year? I think the biggest thing for me in sitting down with the player and being on the court with them is, at the next level you have to do everything right. Whether it is off the court or on the court, I think the biggest thing is just taking care of your body. Who did you the most from during training camp? Nneka (Ogwumike) and Kelsey (Plum) were both great outlets. They were both really open to sharing what they’ve learned in their years of playing. 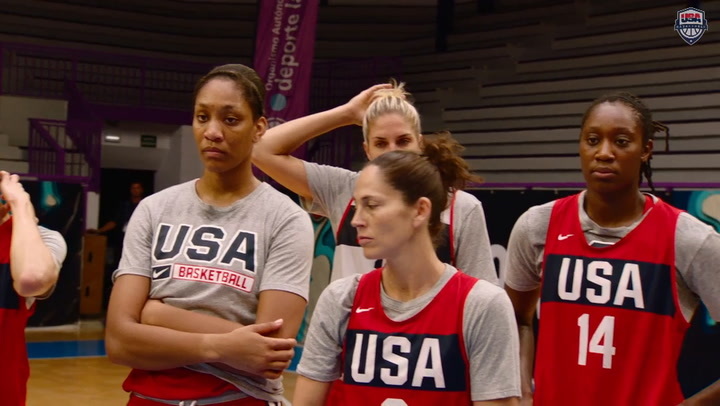 And also, Stefanie Dolson and Morgan Tuck – they play a similar position to me. So, coming here with their experience and what they’ve learned really helps. I think that it was a good showing. It just felt really good to be here and be back in Colonial Life Arena – to play with such great talent. I think we all learned something, I think we grew. It’s definitely exciting just to see Ty here, especially to be here with coach (Staley). This is what it’s all about; it’s why we play what we play. We play for the fans. You play not just for yourself, but for your teammates, former and current. I can’t really put into words how happy I am to see Ty out here. Especially seeing coach Staley coach out here, she really helped this game grow, everything around us, she just brings positive vibes. Just to be involved with and coached by her for four years, it’s definitely a blessing.